The mini-lathe is a many jointed beast. The whole carriage moves left and right and the cross slide moves back and forth. On top of the cross slide is an additional slide known as the compound slide. On my mini-lathe you can adjust the angle of this slide by winding it far to the right and loosening two bolts. You can adjust the angle and use the compound slide to cut tapers instead of mucking about with the tail stock. 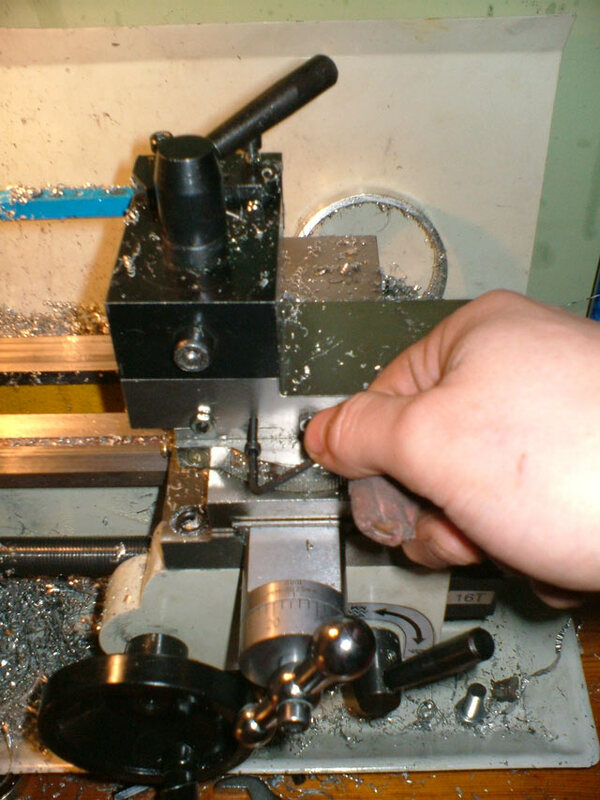 The compound slide on a mini-lathe also allows you to advance the tool by small amount whilst the carriage lock is on or half-nut is engaged. This is both a good thing and a bad thing. The added function is great, but, on the other hand, the compound slide gives a whole extra set of places for the tool to flex with relation to the job. 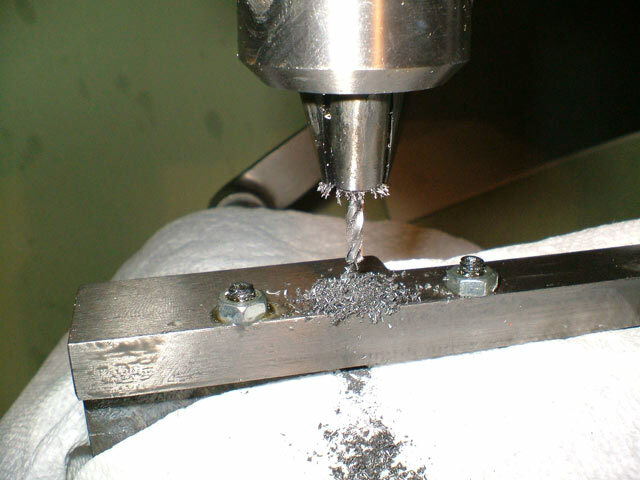 Some mini-lathe users will go to the lengths of removing the compound slide all together and making a new toolpost that bolts directly to the cross-slide. There is a slightly less drastic solution - adding a bolt to act as a crude slide lock. 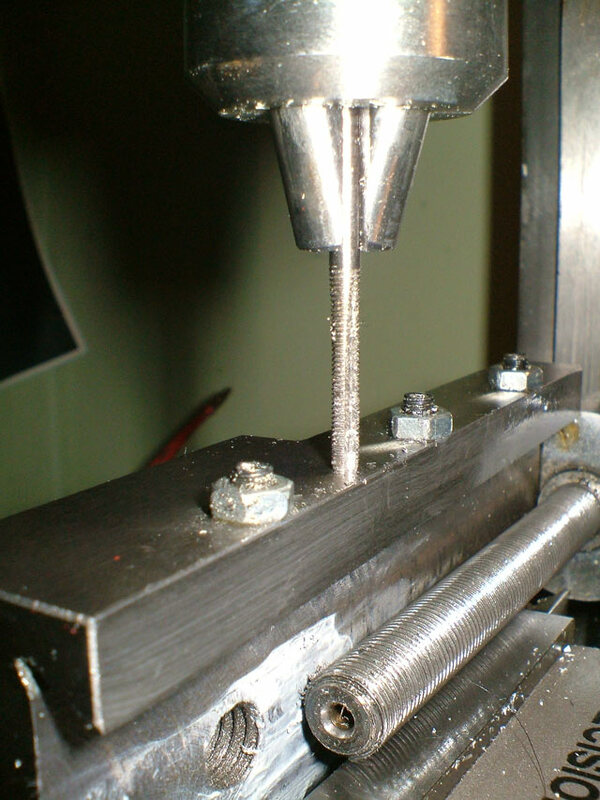 The stiffness of the action of the mini-lathe compound slide is controlled by adjust the three bolts at the front that control the tightness of the gibe stripe. However, these are fiddly and not conducive to frequent adjustment. So I have drilled and tapped a small M3 hole in the side of the compound slide and added a hex head bolt which I can easily tighten and loosen with a hex wrench whenever I need to. This modification is so simple that, along with the carriage lock, every mini-lathe user should do it. First drill a hole into the side of the compound slide. 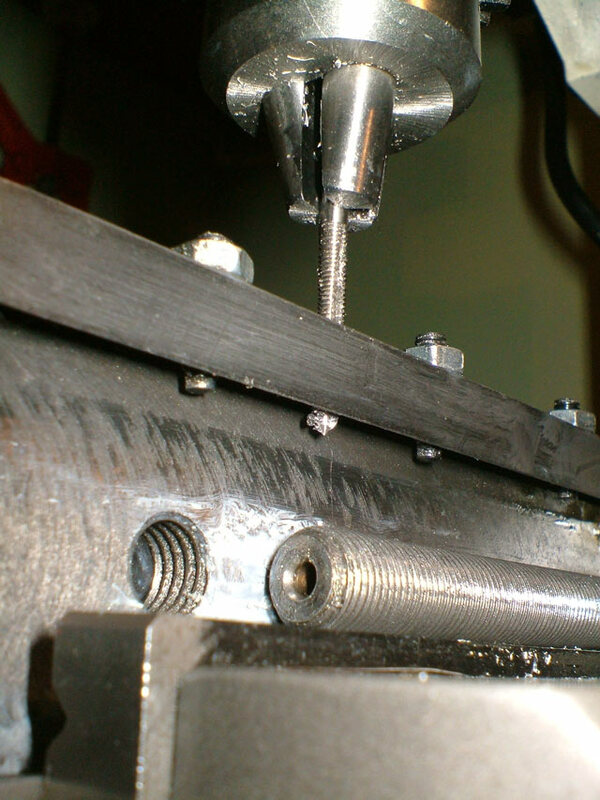 I elected to drill my hole between the two gib adjustment bolts at the toolpost end of the slide. I guess it would make sense to do a second hole between the other two bolts. I marked the position with a center punch. Make sure the hole is positioned so that it comes out in the dovetail section of the inside edge. I drilled the hole on a micro-mill with a 2.5mm drill bit. Next use an M3 tap to thread the hole. I've used the tap in the micro-mill to keep things straight, but don't turn it too fast. Eventually the tap comes out the other side! 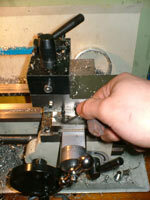 The compound slide of the mini-lathe is made of very tough metal - so go slowly with the tap and use some lubrication. Breaking off the tap in the hole would be a bad thing. Finally re-assemble the compound slide and use a hardened hex head machine bolt to screw into the hole. This is easily tightened with a hex wrench. I suppose you could make a threaded bolt out of hardened silver steel and make a handle, but frankly, I can't be arsed. A hand operated hex wrench is much easier. There it is, a simple compound slide lock. This will help reduce vibration when making cuts that do not require adjustment of the compound slide on the mini-lathe such as boring or turning a bar.